The Axim PR7085 is a concealed rod crash bar panic exit device. 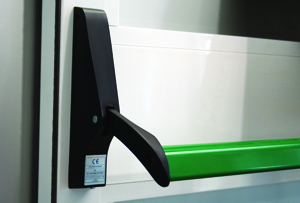 Axim range of horizontal cross bars and push bars are compliant to BS EN 1125. The cross bar is extruded aluminium in a silver satin, dark bronze, green or black anodised finish. All housings and lever arms are finished in an abrasive resistant finish to compliment the crossbar anodising. The exit devices have nylon bushes for silent operation, with heavy duty lever springs for durable operation of the lever arms. Suitable for narrow and widestile doors. All fixings are concealed to ensure an aesthetically pleasing finish. The exit device houses do not exceed 120 x186mm projection.